Remembering Sept. 11: Construction Workers Reflect 15 Years Later In 2001, NPR's Dina Temple-Raston interviewed two men who had been hauling away what was left of the World Trade Center towers. Fifteen years later, she went back to find them. 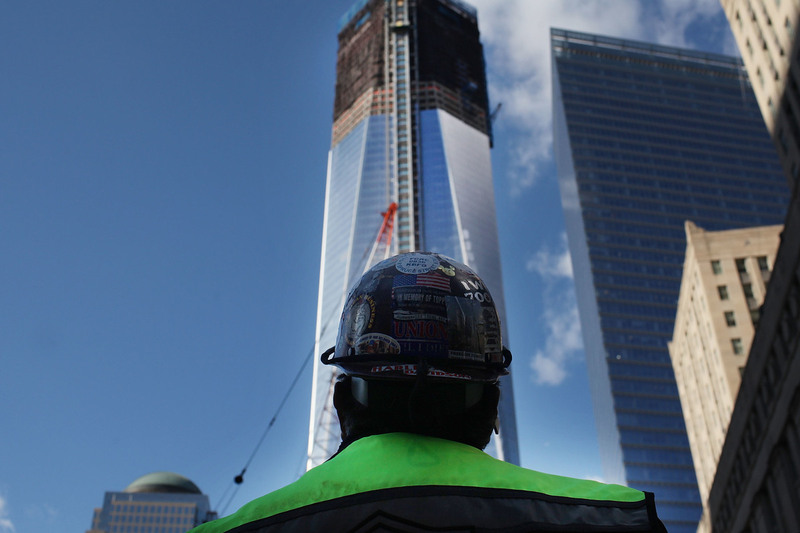 A construction worker looks up at One World Trade Center in New York City, the central skyscraper under construction at Ground Zero, a year before its 2013 completion. Danny Nolan was the first man to swing a wrecking ball in Manhattan in 25 years. Wrecking balls hadn't been allowed on the island for a very simple reason: The buildings are much too close together to allow a huge ball to swing back and forth. An exception was made for Nolan because he, and the other construction workers of the International Union of Operating Engineers Local 14, were "working the pile" — hauling away what was left in the World Trade Center towers after the Sept. 11 attacks. What no one had anticipated at the time was that their demolition job would become something more: a recovery mission. Nolan and hundreds of construction workers like him found themselves stopping work and stepping down from their rigs when they caught sight of bodies in the rubble. "It's never easy; it's devastating," he told NPR in 2001. "You see people coming out, whole bodies found, just encased in concrete powder, and they're not deteriorated. They're coming out in one piece, a lot of them. It's mind-boggling." Bobby Gray was the on-site foreman at the time. His reaction was similarly haunting. "In the first couple of days, there were people that were — I assumed lived nearby — that were actually giving photos of family members, you know, that if you found them," he told me. "I don't know how they did it. I don't know how any of us did it." Fast-forward 15 years. The demolition is over, the rebuilding is almost done. No one seems to know where Danny Nolan went after the demolition work wrapped up. I had stood next to him in the cabin of his crane for half an hour, watching as he took down Tower 6, floor by floor. He showed me how the construction drums worked — how he would set the wrecking ball swinging, and bring it down in one spot so one floor would cascade into the next floor in a cloud of papers, metal and glass. He talked about having nightmares after working the pile. His son used to greet him at the door after work and ask if he'd found any bodies that day. "It was surreal," he told me at the time. Members of Local 14 who looked around for Nolan over the past month told me no one seems to know where he went. If something bad happened to him they'd know, one union official assured me. They thought Nolan had simply moved on. Bobby Gray, the foreman, was easier to find. He's still working on the site, 15 years after the attacks, now putting up buildings instead of taking them down. We met at the base of Tower 3 — 80 floors of glass tower and office space on Greenwich Street — set to open in 2018. "You can't see what I'm working on from here," he said, looking up the side of the building. "But I've always been a tower crane rigger. I put the cranes in and raise them up to the top of the building, and then recover them, either drop them all the way back down or disassemble them on the roof." I wanted to see how Bobby Gray had recovered in the 15 years since the attacks. Were there still things that nagged at him, or had he found a way to move on? He listened to the interview he gave me right after the attacks and shook his head. "I remember one woman in particular," he began. It was early on, before they put a security perimeter up. A woman had handed him a photo of her son and asked Gray if he'd call her should he find them. "All I remember saying is, this is my mother," Gray told me last week. "This is what my mother would do, and this is like everybody's mother whose son didn't come home that day. It's still really, really painful to think about that." The picture is gone, he said. He's not sure where. He seemed genuinely sorry that he hadn't kept it. He seemed to want to say he still had it; he just didn't know at the time that the stranger's photo would end up meaning so much to him. "Looking back, now I know, you never left," he added. "When you were there, you just, you lived, you breathed it, you slept it. And that was it. I guess it's just the way it was, for me anyway." Gray remembers when that intensity of feeling began to fade, not just for the workers, but for New Yorkers and the country as well. "When I used to leave at night, there were a group of people who used to stand out on the West Side Highway and all they would do is honk and wave to all of the people, the workers that were going home ... and it was really special to see that," he said. But as the days turned into weeks, he noticed the number of people fell off. "Gradually, those people got less and less and less, until one night, you drove by and they weren't there anymore" he said. That, he said, helped him put the whole experience into perspective. "That's the way I felt about the whole thing, is that at a certain point in time I'm going to put this behind me, and like I say, compartmentalize it someplace special, until we start talking about it today, you know, and let it come up a bit." Construction on the World Trade Center typically stops on Sept. 11. Bobby Gray said he'll mark the day privately.